Many Americans will be celebrating the start of summer on this Memorial Day weekend with backyard cookouts, and two brands are hoping to cement their invitations to these parties through Augmented Reality experiences in Snapchat. 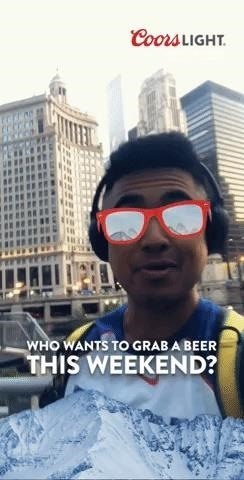 MillerCoors operates a sponsored lens that virtually operates sunglasses on users' faces and a cold can of Coors Light in their hands. The lens sends a virtual can in sight when users raise their hands to the camera view. Coors Light is one of the first brands to use Snapchat's new hand recognition capabilities, according to a corporate spokeswoman. Using Augmented Reality as an incentive to sell is particularly noteworthy considering the weekend and season bets. According to Nielsen Memorial Day, the second largest holiday for beers is sales in the US, only following July 4. Last year, beer sales rose 16% in the two weeks around Memorial Day compared to any other period of the year. In addition, beer will become the top food category in the summer, with over $ 4 billion in sales at major grocers, according to Nielsen Food Channel data from 2017. For those looking for something to combine their drinks with, KFC plans to ask consumers to pass on hamburgers and hot dogs and buy a Crispy Colonel Chicken Sandwich. On Memorial Day, KFC will offer a World Lens that will summon the Colonel in Augmented Reality. The experience will also allow users to win a KFC Colonel Float straight through the Lens. "We saw that the exaggerated pool float trend took on social media and thought it would fit perfectly with our notorious Extra Crispy lifestyle campaign," said Andrea Zahumensky, chief marketing officer of KFC US, in a statement. "Summertime is about making funny memories, and what could be better than floating in the arms of the only Colonel Sanders on the water?" The Lens from KFC shows exactly why Snapchat's new Shopable AR platform will be so valuable to brands. It's one thing to reward customers with AR, but being able to use AR to lead consumers to a buy or, in this case, enter into sweepstakes adds value to Snapchat's overall offering. All this talk of virtual food and drinks makes me ready for the real thing. Happy Memorial Day!